The change to food stamps is part of several proposals to reform welfare. The Trump administration's newly released budget proposal revives a widely panned idea that some food stamp benefits could be sent in a delivery box, one of many changes that advocates say would undermine programs intended to help the most vulnerable people in the country. Critics say the budget signals the administration will continue to pursue welfare reform through additional work requirements to programs likefood assistance, housing programs, and Medicaid. 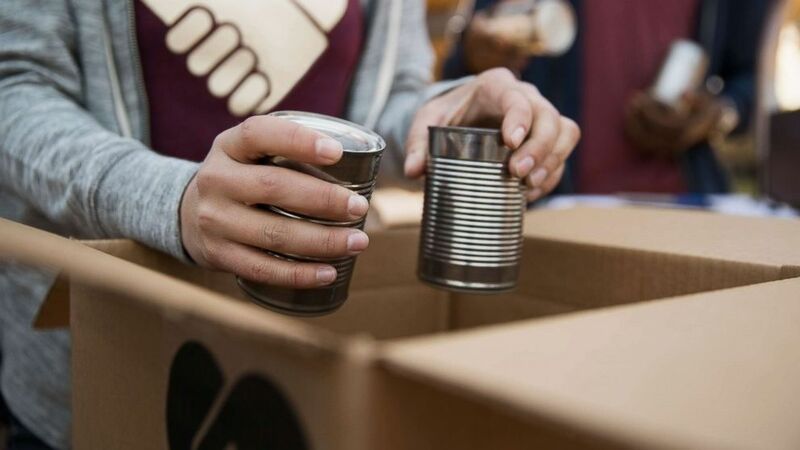 (STOCK PHOTO/Getty Images) An undated stock photo depicts people packing boxes with canned food. USDA's budget mentions the "America's Harvest Box" program, which was first mentioned last year as a way to deliver some food stamp benefits to recipients through a "Blue Apron-style" delivery. The proposal was widely criticized by critics who said it put a huge burden on states who would have to implement the program and would take away recipients' options to buy fresh food with their benefits and provide less healthy processed foods. But administration officials knocked down past criticism of the idea this week and said they would pursue the idea again even after Congress rejected it. "It did receive criticism, but we thought those criticisms were unmerited, and we're not going to walk away from the proposal as it pertains to the harvest box," Acting Office of Management and Budget Director Russel Vought said in a briefing on Monday. "Look, we think there's nothing wrong with putting forward a reform that says, "In addition to your normal food stamps spending benefits that you would get at the retail, that you would get a harvest box that allows you to get a more balanced meal and to save money to the taxpayers at the same time." But the box would use a portion of recipients' existing benefits, not in addition to the normal amount, leaving families' with less money to spend during their normal shopping trips. But advocates say it's part of Republicans' broader efforts to undermine welfare programs and say even if those specific cuts are rejected by Congress, history suggests the administration will still try to pursue welfare reform and work requirements in other ways. Last year the White House proposed drastic cuts and changes to SNAP, including the Harvest Box, that were rejected by Congress in the budget process and again in the Farm Bill. Some of the increased work requirements are now being proposed in a USDA rule which members of Congress have criticized for going around the bipartisan legislative process that already rejected the change. Jim Weill, president of the Food Research and Action Center, called the proposals a "collection of years worth of bad ideas." He said the proposals stigmatize programs intended to help people struggling to make ends meet, even though in many programs they are trying to work but face challenges like access to childcare, lack of skills, or need to care for a family member. "This drumbeat of attacks on the bottom quarter of the population which is struggling with poverty or near poverty and trying to make do with a combination of work and benefits is harmful to the programs and the families and the nation's politics as well," he told ABC News. Vought defended the cuts and changes Tuesday, saying the administration is just trying to reduce discretionary spending and is not targeting any particular group. "We don't think we are going after the vulnerable in this budget..we think we are trying to find reforms that make sense that would improve the lives of those beneficiaries," Vought said in a House Budget Committee hearing on Tuesday. Advocates say that even though specific cuts in the president's budget may not survive Congress, that approach with food stamps shows the administration could find another way to pursue changes that don't survive the budget process. The administration proposed sweeping changes to Medicaid, for example, the federal program that provides medical assistance to millions of low-income and disabled Americans. Trump wants the government to cut some $1.5 billion in the next 10 years from federal Medicaid spending and shift most of that money to state-run grant programs. The move would essentially wipe out the Medicaid expansion effort led under President Barack Obama in favor of limited block grants. USDA's budget proposes a cut in SNAP, or food stamps, to support 3 million fewer recipients in 2020. The administration says this is in line with how many people they expect to drop from the program, seemingly because they have found jobs though it's hard to know. It would also make changes that would make food stamps available for fewer working families and limit the number of schools that can provide free meals to all students. An overall 15 percent cut to the department's budget could also leave less money for nutrition assistance, programs to help people in rural areas, and programs intended to help farmers. The Health and Human Services Department budget proposal includes something they're calling "Welfare to Work" partnerships to redesign assistance programs to focus more on "promoting personal responsibility" instead of relying on government programs. In the last two years, the administration has pursued several welfare reform proposals focused on self-sufficiency on the premise that many adults receiving assistance are capable of working but simply aren't motivated to or can't find work. The administration plans to encourage states to change child support systems to order any noncustodial parent with overdue payments to work, instead of only parents whose children receive government assistance. The Department of Housing and Urban Development budget would reduce housing benefits for adults the government sees as able to work, requiring them to prove they are working or looking for work and pay a larger percentage of their rent. The department proposed similar changes last year.